Although there are many lovely wedding ring pillows available for purchase, you can add a special touch to your event by making your own. 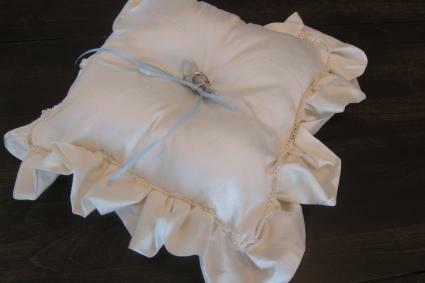 You don't need to have years of sewing experience behind you to sew a gorgeous ring bearer pillow. In fact, it's actually quite easy to make an heirloom quality pillow that you'll treasure and pass on for years to come. This sweet wedding ring pillow is crafted from luxurious dupioni silk, which gives it a subtle sheen. Silk comes in every color of the rainbow but for a classic look, choose white or ivory. You can dress it up with a ribbon in the wedding colors. The finished pillow is eight inches square, not including the ruffle, and it will take you about two hours to make. Start by cutting out the pieces you'll need. For the pillow itself, you'll need to cut two nine-inch squares of dupioni silk. You'll also need a piece that's five inches wide and 65 inches long to make the ruffle. You will likely need to join two pieces together to get the appropriate length for the ruffle piece. Fold the ruffle piece in half, matching the short sides together. The right sides should be in. 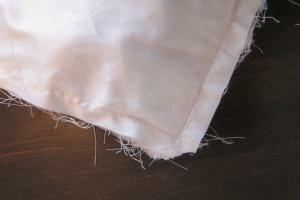 Using a half-inch seam allowance, sew a seam to create a loop of fabric. Use your iron to press the seam open. Then fold the fabric over on itself, wrong sides together, matching the raw edges. Use your iron to press it. Set your sewing machine stitch length to 5.0, and sew two parallel lines of stitches very near the raw edge. Pull on the ends of the thread to gather the fabric, creating the ruffle. You'll need the gathered edge to be 32 inches. Lay one of the squares on your work surface. Use a disappearing fabric marker to make a light line half an inch from the raw edge all the way around on the right side. This will show you where the seam will be. Pin the lace just to the outside of this line, all the way around the pillow. The decorative edge of the lace should be facing in toward the center of the square. With your sewing machine stitch length still set to 5.0, baste the lace in place to hold it neatly as you work. Lay the other square on your work surface, and pin the ruffle to it with the ruffle facing the center of the square and the raw edges lined up. Baste the ruffle in place, sewing just short of the half-inch seam allowance. Stack the two pillow pieces with their right sides together. Use pins all the way around the edges. Sew the pieces together using a half-inch seam allowance, but leave four inches open for turning the pillow. Use care to keep the ruffle out of your seam, particularly at the corners. Clip all four corners at an angle to reduce bulk, but be careful not to clip too close to your seam. Dupioni tends to fray. Turn the pillow right side out and use your iron to press it. Then stuff the pillow with polyester stuffing until it's as firm as you would like. Hand sew the opening closed. Measure to find the exact center of the pillow, and use the disappearing marker to mark a dot on this spot. Using a double length of thread, create a tuft in the center of the pillow by sewing up and down several times and keeping the thread taut. Make a bow out of the ribbon and attach it to the center tufted area of the pillow. Then cut another length of ribbon about 24 inches long and sew this over the center of the bow. You can use the ribbon tails to tie the wedding rings on the pillow. Making your own ring bearer pillow is a great way to personalize your special event. In addition to choosing the colors for the ribbon and fabric, you can embroider initials or the wedding date to make it even more meaningful. If you take your time and use fine fabrics, this is a project you'll be able to pass down for generations.